MORE THAN READY (USA) (Bay 1997-Stud 2001). 7 wins-5 at 2, Saratoga King's Bishop S., Gr.1. Leading Aust. Sire of 2YOs twice. Sire of 2422 rnrs, 1778 wnrs, 192 SW, inc. More Joyous (ATC Queen Elizabeth S., Gr.1), Catholic Boy, Sebring, Prized Icon, Phelan Ready, Benicio, Roy H, Samaready, Verrazano, Entisaar, Rushing Fall, Room Service, Regally Ready, Perfect Reflection, Dreamaway, Uni, Eagle Way, More Than Sacred, Perfectly Ready, etc. Deep Image (g. by Testa Rossa). 4 wins at 1350m, 1400m, A$105,550, to 2018-19, BRC Memberships P., Family Fun Raceday H., 2d BRC Gold Edition P., L, 3d BRC Treasury Ladies Oaks Day P.
Speedgun (g. by More Than Ready). Winner. See below. Moon Phase (g. by More Than Ready). Winner at 1200m in Aust. On a Comet (g. by More Than Ready). Placed at 3 in 2017-18 in Aust. STELLA CADENTE (Centaine). 5 wins. See above. AT THE OASIS (Desert Sun). 7 wins from 1200m to 1800m, A$192,825, Kilmore Cup, L, MRC Poetic King H., Bramerton H., 2d VRC Comedy King H., 3d MRC Theo H.
Cabrera (Falvelon). 9 wins to 1300m in Malaysia and Singapore, Singapore TC Class 5 H., 2d Penang TC Dr Lim Ah Soo Memorial Trophy, L, Singapore TC Initiation P., Class 4 H.-twice. Pompeius (Magnus). 2 wins at 1750m, 2000m, A$111,750, 2d VRC Connoisseur S., L, 3d Sale TC Inglis Trophy. Centella (Spectrum). 2 wins at 1200m, 1300m in Aust. and Macau, 2d VRC View 2YO H., 3d VRC Thoroughbred Breeders S., Gr.3, MVRC Silver Jubilee S., L.
Race Record: 9 Starts 1-2-1 A$29,000. 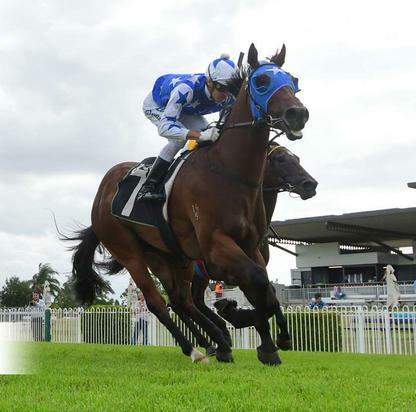 Winner at 1100m in 2018-19, Ipswich TC Kevin Keidge Memorial P., 2d GCTC $1.5m Jewel Raceday H.